21 Things That Will Become Obsolete in Education by 2020 [TeachPaperless via EdReformer] - I agree with most of these to varying degrees, but some are off. Real books (#8) are not going anywhere--their role in schools will certainly be reduced, especially as we transition away from traditional textbooks over the next 20 years, but they're not going to be completely obsolete by that point. Charters: Ten Things Charters Won't Tell You [This Week in Education via WSJ] - I'm just speechless on this one. Every single item on this list is flat out wrong. There are certainly bad charters, just as their are bad traditional public schools. To make such sweeping generalizations is irresponsible. I'm surprised that this didn't illicit a stronger response across the edublogosphere. Slate's Classroom of the Future [via GOOD] - Is this vision practical, or even possible? The Expectations of a Teacher [Fix Public School] - A teacher lists 31 distinct expectations placed upon her, some of which you won't find in a contract or employee handbook. She doesn't specify which items on the list are expectations she places on herself, instead of those put upon her by the school or district administration. What would you add to the list? What doesn't belong there? Opinion: What Makes a Great Teacher? Students Share Their Top 11 Traits [AOL News] - I don't think there will be too much controversy from this list, but it does merit discussion: How many of these traits do you have? What do they look like in your classroom? Just before winter break, a friend of mine revealed that she was unexpectedly switching assignments at school, taking over for a teacher who was leaving mid-year. Worse yet, the switch happened one week before the break began, meaning there would be little time to plan the crucial first days with her new class. It was not the ideal situation. In Boston, I faced this situation myself. Heading into the school year, I was all set to teach Algebra I. The day before school started, my principal emailed me to explain that I would also have to teach a section of Algebra II. A few months later, I took on an additional Algebra II class that had been moved over from a colleague in order to even out class sizes, resulting in students shifts that fundamentally changed the culture of all classes. In essence, I had to take over new classes twice in the same year, so I had quite a bit of unsolicited advice to offer. The course content, while important, is secondary to building the foundation needed for a successful classroom. You can and should try to pick up where your departed colleague left off, but in a way that allows you address the goals above. For example, one suggestion I made to my friend for the first week was to give students assignments that they could work on independently or collaboratively for the most part (addressing the necessary content), and pull students asides individually for a few minutes each. In these short conversations, you could get their perspective and feedback on the transition, ask what you as the teacher can do to help make this student successful the rest of the year, and tell them the particular way they can contribute to the class going forward. To facilitate the transition and these kinds of conversations (whether you have them individually, in small groups or as a whole group), start by giving the students simple, open-ended surveys (see below). Use them to inform what you discuss and how you discuss it. Special Series: "On Failure" & "On Success"
I'm happy to help people who have specific questions or need other kinds of resources. Just ask. If you have your own advice (or opinions about mine), please share them in the comments. If you're on the East Coast or just about any U.S. region besides my beloved Rio Grande Valley, you're likely snowed in due to Snowpocalypse 2010. What better time to catch up with new ideas and resources for video games in education? Learning by Playing: Video Games in the Classroom [NY Times via edReformer & This Week in Education] - A deep look into how video games help kids learn, framed around a profile of the innovative NYC school Quest to Learn. Project-Based Learning, Yes PLIESE [Wired: GeekDad] - In this project-based learning example, a child is deeply invested in designing everything from the storyline to the artwork and level design for their own video game (in this case, a new Mario game). Even without using the technology directly, the structure can provide a context that kids can understand and want to throw themselves into. When the White House announced an ambitious STEM Video Game challenge in September, I was excited as it seems my dream of educators and game developers working together to create immersive, engaging educational games is close to fruition (see No Need to Reinvent the Wheel to Revolutionize Educational Video Games, my guest post on Educational Games Research). Physics Gaming [via EdReformer] - Tons of games using that use classic physics problem archetypes like bridge building and predicting an item's flight path in fun ways. All free, courtesy of the math games gurus at Manga High. Hundreds and Hundreds of Edublog Recommendations! Top 50 Blogs by Elementary Educators [Elementary Education Blog] - I am included in this list as #28, despite not being an elementary educator. I'd like to think I've shared enough elementary-focused ideas and resources that would justify my inclusion. As the cliche goes, it's an honor just to be nominated. 50 Amazing Blogs for Elementary Educators [The E-Advisor Blog] - Here's one list I'm not included on! 2010 Edublog Awards - Voting is open! You'll find another 100+ education blogs across dozens of categories here. You'll find a lot of overlap on these various lists for sure, but that should be a good sign of a quality education blog. Need a Stocking Stuffer for Your Favorite Educator? Originally, my book Teaching is Not a Four Letter Word: How to Stop Worrying and Love the Job was partly conceived as an ideal stocking stuffer for your favorite educator. Now's the time to make that thought a reality. I've put the print edition on sale for 40% off, and it will stay that way through December 14th (because you likely won't be able to get it in time for Christmas if you don't order by then). Buy your gift copy today! Need to know more before you buy? No problem: read all about the book here. Animated Short Sums Up America's Education Problem [GOOD] - Waiting For Superman as summarized by a Taiwanese news program in less than 2 minutes. Documentary: Fermat's Last Theorem [mental_floss Blog] - The story of the most puzzling math problem ever! Your Broken Meetings Need a Responsible Parent [Lifehacker] - Make sure somebody is the "parent" in your meetings at work, whether it be you or someone else. Video: Math Teacher Meltdown [This Week in Education] - In case you somehow missed it, this is what it looks like when a teacher loses it. It's worth noting that this is what we all look like when we lose our temper, even when we don't completely lose our minds like this guy. As a follow up to yesterday's guest post on getting a degree in Educational Leadership, I wanted to share my own perspective. I just started a master's degree program in Educational Administration, which at the University of Texas-Pan American is part of the Educational Leadership department and a precursor to its namesake doctorate. For most of the last calendar year I've been working for IDEA Public Schools, a highly successful charter school organization that serves nearly 7000 students in 16 schools across south Texas. I'm Chief of Staff for the Founder and CEO, which means I am privy to just about everything involved in running the organization--everything from what's happening at the schools to the painstaking details of finance and development. While it's a welcome challenge, and very exciting to say the least, the learning curve is very steep. There are many areas where I can contribute, but as my background is grounded completely in teaching, I have a lot to learn. That's where this kind of graduate program comes in. We've spent our time thus far discussing all of the issues schools deal with from the perspective of a principal and/or superintendent. I've learned a lot about school law, finance and politics that has helped me in my job. I've also learned more about the similarities and differences between how charters and traditional public schools must deal with these issues (hint: it's more similar than you might think). Finally, I've had the opportunity to teach a lot of future leaders in my region that much of what they think they know about IDEA (and charters in general) isn't true. I feel like I've gained quite a bit, and I'm only in my first semester. My goal isn't to become a principal or superintendent necessarily (which puts me in the minority of my cohort) but that doesn't mean I can't get just as much out of this program. I'm in a central office position in a growing and changing organization, which makes the need for the broad knowledge I'm getting from this program obvious. Yet I also realize that even if I had still been a teacher who was undecided about taking an administrative position at the school or district level, I still would benefit greatly from looking at education from this very different perspective. I hope that no matter where you are in your career in education that you consider what you could get out of a masters or doctorate in Educational Leadership. Our profession needs great leaders at every level to ensure children are getting a great education. As always, I'm happy to answer specific questions. Please send me an email or leave a comment and we can dive into this topic a little more. Educational Leadership graduate degree programs prepare education leaders to analyze and solve the types of problems faced by schools. The programs also provide the knowledge and skills required to motivate the staff to perform at a higher level. Educational Leadership Master's Degree programs provide educators with the tools needed to be effective leaders in educational organizations and in their school's community. Educators also learn to become effective advisers and mentors to beginning educators. The programs also teach individuals how they can affect change in the systems that govern national, state, and local education. The master's degree programs review current educational trends and innovative curricular designs in the context of improving student performance. Popular concentrations include instructional leadership, school leadership toward administrative licensure, and leadership for community and organizational learning. Many of these program require an internship. Programs offering a Doctorate (Ed.D) degree typically require applicants to have leadership experience and a master's degree. Administrators and teachers enhance their abilities to influence and transform educational environments. The programs provide new and innovative models of leadership. Many of the doctoral programs are designed for working educators and include full-time study during the summer and weekend terms during the school year. Due to convenience and flexibility, online Ed.D in Educational Leadership programs are increasingly popular. Some of the common courses in doctoral programs are perspectives on leadership, qualitative research in education, data analysis for organizational leaders, and leaders as researchers. Some online graduate degree programs offer students the opportunity to meet multi-state, course-work requirements for academic licensing of principals, assistant principals, and instructional supervisory personnel. Graduates of some of these programs are qualified to take the School Leaders Licensure Assessment (SLLA) test. Some of the programs are based on the Intestate School Licensure Consortium (ISLLC) Standards which place children and their learning as the foundation of school administration. Another option is the graduate certificate of advanced studies in educational leadership. A number of colleges and universities around the country offer these programs. Numerous accredited colleges and universities offer graduate degree programs in educational leadership. Educators interested in advancing their careers while affecting positive change should definitely consider these programs. Brian Jenkins, a member of the braintrack.com writing team, writes about a number of topics related to education. How Does Depression Affect Your Students? You may have noticed one or two students in your classes who just don't seem all that interested in your teaching. This might surprise you, right? After all, you're probably a very dedicated teacher: you put effort into your class plans, you respond to your students' work, you try to treat everyone well. But for some reason, there are always a few students who just don't react as you would expect. Naturally, this is frustrating, and it may be tempting to think poorly of these students or to see their lack of interest as evidence of a bad attitude. However, check these initial thoughts before you talk to the students. There's a chance your student could be dealing with depression. Below I've tried to describe what they might be experiencing so you'll be better able to empathize with them during your next class. Students who are depressed often feel physically exhausted. They might have trouble sleeping at home. They might lose their appetite. They tend to avoid physical exercise. Due to this exhaustion, they may struggle to stay awake in your classroom no matter how exciting the activities are for the day. Students who do sleep well might still be tired during school. This is part of the physical toll that depression takes upon those who suffer. Naturally, this physical exhaustion can consume a student's ability to concentrate in class, thus harming his or her learning process. Along with the physical exhaustion, depressed students can suffer from mental anguish. Feelings of low-self esteem, a desperate sense that nothing matters, and a loss of interest in daily activities can greatly hamper a student's education. If his or her thoughts are devoted to investigating the anxiety he or she feels, then it will be harder for that student to apply his or her energy to the day's lesson. Because students who are depressed often have issues regarding self-esteem, they tend to avoid social interaction or they might interact awkwardly with their peers and their teachers. Social anxiety adds to their reluctance to participate in class. Imagine feeling depressed and being called on to answer a question in class. Not only could this challenge your low self-confidence, it also seemingly exposes it for all to see. The threat of judgment greatly affects a depressed student's social presence, causing him or her to withdraw as much as possible. These students might relegate themselves to a corner of your classroom. Of course, every one of your students is an individual, so depression will manifest itself differently in each student. The above write up is only meant as a tentative guide to allow you to see how depression could affect your students. If you do believe one of your students is in fact depressed, contact your school's counseling center or someone who is professionally able to handle the problem. But remember that although you may not be qualified to help in serious instances, you are the first line of defense in protecting the student from danger. This guest post is contributed by Kitty Holman, who writes on the topics of nursing schools. She welcomes your comments at kitty.holman20@gmail.com. Use it or Lose It [GOOD] - Explains one reason schools piss away money. 30 Ways to Rate a College [The Chronicle of Higher Education via Lifehacker & GOOD] - The Chronicle compares how different magazines rank colleges in an enlightening infographic. Which Rankings Can Actually Help You Pick a College? [GOOD] - Anya Kamenetz, author of DIY U Edupunks, Edupreneurs, and the Coming Transformation of Higher Education, "endeavor[s] to rank the rankers." SweetSearch Finds Credible Research Sources for Students [Lifehacker] - Help get them prepared for college-level research by using tools like this before they get there. The Real Value of College [The Quick and the Ed] - Have an intelligent discussion about what's right for your students/children. ABCs and 123s Apps Your Kids Will Actually Enjoy [Wired: GeekDad] - Side note: I've been reading this blog for over a year, and I can't figure out why they call it GeekDad. There's really very little that could be considered Dad-specific. It should be called GeekParent! Changing the Preschool Quality Debate [The Quick and the Ed] - A response/companion piece to the previous article. Next Gen Learning Challenges - Have a great idea for improving college readiness with technology? There's grants of $250,000 to $750,000 available to fund it through this program. Rhythm Rhyme Results - This company makes educational rap music that's not going to make you want to gouge your eyes out. They do sell their music, but there's quite a few free resources to download and/or access through their site. Nonprofit At Work On Free Digital Science Textbook [The Consumerist] - This needs to be done for every subject and grade level, whether it be by a nonprofit or a university. Perhaps you can tie this to the second link above? Review: LEGO Mindstorms Education Kit [Wired: GeekDad] - Expensive, but worth every penny. This should be in math and science classrooms across the country! 82 Stores Offering Discounts for Teachers [Brad's Deals] - The fine folks at this coupon/deal-sharing blog did their homework and compiled a huge list of discounts to offset all of the out-of-pocket spending teachers do. Absolutely needs to be bookmarked for quick reference! Speechless. [Look at my happy rainbow!] - Mr. Halpern attempts to teach the difference between fiction and non-fiction, with hilarious results. Study: Principal Leadership Improves Student Learning [edReformer] - Now, how do we replicate this kind of program across the country? Chess Helps Troubled Kids in School [Educational Games Research] - Board and card games are not obsolete yet; in fact, I think they're more interesting for the "digital native" generation because for them, it's such a novel concept that something so simple can be so powerful. What Can We Give to Teachers to Make Them Better Teachers? [GOOD] - Spot on infographic that visualizes the responses of 40,000 teachers. The Spirit of Community Awards has been honoring tens of thousands of middle and high school students for their volunteer work over the past 15 years. And now is the chance to get your students involved! On behalf of the Prudential Spirit of Community Awards, I invite you to encourage a young person in your life to apply today! The Prudential Spirit of Community Awards is the largest youth recognition program in the country based exclusively on volunteer community service. And what better way to recognize our young heroes and inspire others to follow their lead than honoring them with these prestigious awards? If your students are from grades 5-12 and have demonstrated outstanding volunteerism over the past year, then encourage them to complete an online application at http://spirit.prudential.com. State and national honorees will receive a cash prize, a trip to Washington, D.C., and an engraved medallion to thank them for the great work they have done. Please spread the word to your neighbors, colleagues, friends and family! Teaching is Not a Four Letter Word now available on Amazon! 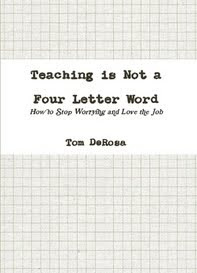 My second book, Teaching is Not a Four Letter Word: How to Stop Worrying and Love the Job, is finally available on Amazon.com. Find out all about the book here. Online courses are gaining in popularity by the day; they’re sought after not just by adults who want to go back to school after a gap, but also by professionals who are looking to advance their careers and augment their earning potential. Today, the quality of education provided online is as good as that provided at any regular university; so if you do your research carefully and choose your school and course accordingly, there’s much to gain in the process. If you’re in the teaching field and are looking for ways to develop professionally and grow personally, online courses are tailor-made to help you achieve these two goals. You improve your qualifications and academic credentials. This allows you to apply for positions higher up than the one you hold and provides you with the skills and knowledge required to climb up the career ladder. You learn much more than you know now, and your enhanced knowledge and growing skill set allow you to compete with the best in the industry and still hold your own comfortably. If you want to switch careers – say if you feel like moving to teaching at college from teaching at school – online courses are the best way to achieve your goal. They allow you to stay at your current job even as they prepare you for the one you’re aspiring for. You learn how to manage time better – your plate is full what with studying, attending classes, handling your responsibilities at the workplace, and taking care of familial and social duties, so unless you’re good at allocating time for each and balancing them all, you’re not likely to succeed. You cultivate the discipline required to concentrate all your energies on the job at hand (be it studying or working) so that you can get it done in the shortest possible time and in the most effective manner. You learn how to multi-task effectively without compromising the quality of the work you’re doing on all those tasks. Earning a degree gives you a sense of personal achievement, especially if you’ve done it against all odds or at a time in your life when people have written you off for various reasons. The older you are, the more you appreciate completing a degree. Remember however, that the benefits of online education are realized only if you make the effort to choose the right school and the right course – they must be accredited and serve to enhance your job skills and provide you with a means to move up professionally. Also, because you’re most likely going to be studying and working simultaneously, you must have excellent time management skills and also possess the required discipline and dedication to devote your energies to both tasks without shirking one for the other. This guest post is contributed by Carrie Oakley, who writes on the topic of online colleges. Carrie welcomes your comments at her email id: carrie.oakley1983(AT)gmail(DOT)com. Every link in this week's Five for Friday came from my personal learning network on Twitter (you can find me here). Recently, I launched a Twitter account for IDEA Public Schools, the charter management organization I work for. I'm well aware that very few people in the organization (and the wider educator community) understand that it's for far more than checking in on what celebrities had for breakfast. It is without a doubt the most powerful professional development tool I've accessed since starting this blog in 2007. If you haven't looked into it, I think you should. Google's Improved Apps Help Educators [School Library Journal] - Quick and dirty overview of how educators can use recently improved Google Apps to help their students. Philly Teacher - Awesome teacher blog focusing on technology integration in the classroom. Just added it to my RSS reader. You can find the blogger, Mary Beth Hertz, on Twitter. How to Help Your Child Deal With Big Feelings [My Mommy Manual] - Might I also suggest the Wild Ride to the Heart board game? 10 Ways to Play and Learn with Building blocks [Quirky Momma] - I think you could adapt a lot of these ideas no matter what kind of blocks you're using (from foam/cardboard boxes to Legos and beyond), which is certainly a good thing. 5 Ways to Build a Better Teacher [Developing Education] - Not just for administrators-- mentors and other veterans should take note. Math Teachers At Play #30 - Lots of great ideas for teachers in any subject. 50 Excellent Open Courses on Teaching With Technology [Online Colleges & Universities] - Don't get overwhelmed; as you would with any resource, pick and choose what makes sense for you. Two courses for parents from the New York Times - The Grey Lady is offering a course on the college admissions process and another on teaching teens about money. They're not free, but reasonable. Heaven knows it’s hard enough to get students to pay attention in class sometimes, but engaging students—really engaging them—is one the hardest and best things that educators can do. And one of the best things that teachers can do to engage their students is to get them involved in projects that help them see, touch, and feel the world around them. These are the types of projects that help them make connections between the math, language, science, and creative skills they are learning in the classroom and the everyday world around them. And students, especially the younger ones, love to be able to touch and hold the results of their labors in their hands. They feel great when they can take a project home with them and beam while they show their parents what they did in school today—what they accomplished all by themselves (with a little help from the teacher). The great thing about teaching in the 21st century is that there is more technology available to day than at any other time in the history of the world. And that technology is making teaching easier, cheaper, and more engaging. One of the great revolutions going on right now is in print publication. It used to be that if you wanted to publish a book, you had to get an agent (if one would take you) and then trot your book around to a number of publishing houses, until (if you were lucky) an editor looked down his nose and deemed your book worthy of publication. No more. Today there are a number of ways to easily and cheaply produce a publishing-house quality book for each and every one of your students. And each student can write their own unique book, help design their own cover, and produce it for about as much as they might pay for school lunch in a week. It doesn’t matter whether students are writing books about dinosaurs, art, or creating their own math textbook, there are a number of useful sites to help you publish their books. Lulu is one of the best self-publishing sites on the web. It gives you enormous freedom in the size, shape, and feel or your book and (if you so desire) lets you sell your book on Amazon and in the Apple iBookstore. Geared more toward private publishing, Blub has a great range of styles and prices. Another great book creating site that offers a wide range of options and gives you access to sell your book on Amazon as well. Let your students’ imagination run wild. Engage your students, help them learn, and give them something to beam about by helping them to publish their work and take it home with them. Gunter Jameson writes about several topics including travel, minimalism and online classes. The LOFT Loves Teachers program is providing grant funding to teachers through a dynamic partnership with the Kids In Need Foundation. LOFT will provide over 100 grants, totaling $50,000, so that educators may purchase supplies needed to conduct innovative projects in their classrooms. All certified K-12 teachers in the U.S. are eligible to apply for a grant valued at up to $500. The LOFT Loves Teachers program is dedicated to recognizing educators and the valuable contributions they make every day. By showing valid school identification educators receive a 15% discount on all LOFT purchases. The LOFT Loves Teachers community offers access to special offers and style tips to outfit teachers in stylish yet functional looks for the classroom. Above all, LOFT Loves Teachers strives to identify ways to positively impact the educational process that teachers give shape to every day. The application deadline for grant requests is September 30, 2010. For more information on the LOFT Loves Teachers program and to register for a grant please visit our Facebook Fanpage at www.facebook.com/LOFT and click on the LOFT Teachers tab. In addition, here's a direct link to the application. Good luck! Export All Your Google Docs to a ZIP File - You should always be backing up your work! Embed PDFs and PowerPoint Files for No-Software Viewing - For your class blog or one you use for sharing resources with your colleagues. Break Your Cycle of Stress with Guilt-Free Vacations - If you don't feel like you need this already, you will... soon. Kids can learn a lot on their own, if you just give them the right tools. This is by no means a secret, yet we are so quick to forget. It was a good reminder of how it's more important for teachers to be facilitators than anything else. Using technology to start closing gaps is simpler than you think. To repurpose a classic Bill Clinton line: It's the software, stupid. We worry too much about the hardware--smartboards, laptops, iThings--and not enough about what we're doing with it. Accelerated Reader - Leveled library quizzes are used across grade levels. While Rocketship doesn't have the research to prove that these programs are driving their success, it's hard to believe they don't have a lot to do with it: they're already the #1 school for low-income students in the county, and #3 in the state. They have commissioned a study this year to figure out the efficacy of students' time, so we'll see whether the research backs up the results. More importantly, Rocketship isn't content to wait for the results: they're already exploring better, more adaptable apps that will make it even easier for teachers to focus Lab time on what kids need. Using a Learning Lab for interventions will help teachers be more effective. Students spend their lab time practicing basic skills, getting more help when they need it and pushing them forward when they're ready. This means the classroom teachers spend more time teaching new concepts, exploring higher order thinking and problem solving in a project-based environment. It means less frustration for teachers who don't have to push back new concepts in order to review and reteach constantly. Most importantly, reports from the programs tell them how their kids are doing on specific skills and objectives, allowing them to better tailor their in-class work. You might argue that since so little time is spent in these labs that it's probably just good teaching that's resulting in their fantastic results, and I won't discount the ability of their great staff. Let's not downplay, however that because the lab time is used so efficiently, it allows these good teachers to push their students much farther than they would otherwise. There's still a long way to go in the area of individualized, adaptive education software. While the programs used at Rocketship schools are adaptive--meaning they provide extra help when kids are struggling or move forward as rapidly as they need--the scope and sequence of the work often isn't under the control of the teacher. In other words, they don't and can't align perfectly with a teacher's curriculum just yet. I also have to go back to an argument I've made before: universities, governments and non-profits need to step up and develop highly customizable, data rich, comprehensive standard-based software that's either low cost or free. I'd love to see Secretary of Education Arne Duncan devise a "Race to the Top" for the next generation of adaptive educational software. A great deal of research has clearly demonstrated that the early years – ages 2 to five – are the best time to educate children in different modes of communication and language. This goes beyond the spoken word (though it is an optimal time for children to learn a second language); many young children have an aptitude for signing as well. This is not as odd as you may think. As you know, many indigenous peoples around the world, including American Indian nations, have used sign language for centuries to facilitate communication with other tribes with whom they do not share a language. Some paleontologists and anthropologists theorize that Neanderthals – who apparently lacked the vocal mechanism to produce many spoken words – depended a great deal upon hand gestures to communicate. The author also cites study funded by the National Institute of Child Health and Human Development demonstrating that young children who are taught sign language at an early age actually develop better verbal skills as they get older. The ability to sign has also helped parents in communicating with autistic children; one parent reports that "using sign language allowed her to communicate with her [autistic] son and minimized his frustration...[he now] has an advanced vocabulary and excels in math, spelling and music" (Glarion, 2003). Not only does early childhood education in signing give pre-verbal youngsters a way to communicate, it can also strengthen the parent-child bond – in addition to giving children a solid foundation for learning a skill that will serve them well in the future. The evidence suggests that the best time to start learning ASL is before a child can even walk – and the implications for facilitating the parent-child relationship are amazing. Teach Your Tot to Sign: The Parents' Guide to American Sign Language by Stacy Thompson. This guest post was co-written by Emily Patterson and Kathleen Thomas. Emily and Kathleen are Communications Coordinators for the Zionsville educational child care facility, a member of the AdvancED® accredited family of Primrose Schools (located in 16 states throughout the U.S.) and part of the network of Indiana educational child care preschools delivering progressive, early childhood, Balanced Learning® curriculum. This week's entry comes from Ms. Chen, who teaches in rural New Mexico. Check out her blog, red pen revisions. Here is a lesson I’ve learned this year. Take your kids outside, and whatever you do, don’t plan. You will be surprised by what you learn about your students and what they too will learn. Our walk happens on a trail that is rocky and unpaved, lined with low, serpentine shrubbery and prickly vegetation. My students bring me treasures they discover. B. announced his discovery of a lizard by holding it up in the air by its tail. The sandy white lizard lay limp, perhaps hoping to play dead in an attempt to be left alone. No such luck; my students fingers poked and prodded with delight. T. brought over a local variety of honeysuckle, its pink shoots interspersed with white-yellow ones. He offered me one, telling me to taste it. "It tastes of watermelon summer," he analyzes reflectively. We have found seedpods I am unable to identify; so we strip it down to its tiny black seeded center. We have crept up quietly upon two baby bats, nesting in the eaves of the school. My students were hushed with an awe I can only aspire to inspire in the classroom. We have found a vertebrate column, the blood not yet bleached white by the southwestern sun. We speculated on the animal based on the size; we settled upon goat, or at least a very large dog. It is on these walks my students express the imaginations that I do not often get to see in the classroom, and vocalize curiosities so rarely stimulated by our formulaic textbook curriculum. I read a short story recently about a creative little girl whose "lies" often got her in trouble with "the adults." She held tea parties where no one attended but herself, and contentedly, "she swallows cups of invisible tea. She chews mouthfuls of air." And so every afternoon, I'm reminded of the joy that is childhood curiosity as we have our sunshine-drenched cups of invisible tea and great mouthfuls of air. Read more about this ongoing project here, then email your entries to teachforever AT gmail DOT com. Week 41 is scheduled for next week. 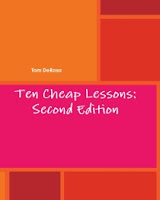 The PDF (eBook) version of Ten Cheap Lessons: Second Edition is available to download for FREE today, Monday, and Tuesday only. By Wednesday, the deal will be gone... don't miss out! Seven Steps to Sweet Slumber [GOOD] - Once you convince them that sleep is good, take advantage of the teachable moment and give them some pointers on how to get it. Putting Events in Context By Putting Them on Your House [GOOD] - The most exciting one on this list, for sure. Participate in the 52 Teachers, 52 Lessons community project. Piloted with preschoolers, the Shift and Shine Technique is a simple, fun and powerful tool for children ages 3-6. This scientifically developed technique gives young children an early start at developing and strengthening positive attitudes and emotions. Practiced regularly, Shift and Shine can help young ones control impulsive behavior, improve relationships with family and peers and increase their readiness for learning and the classroom environment. Shift and Shine Technique for Ages 3‑6. The HeartShift Tool helps you calm down and think more clearly. It teaches you how to feel better when you are upset and how to shift from a negative emotion to a positive emotion. The HeartShift™ Tool for Ages 7 – 11. Quick Coherence is a powerful technique for refocusing your emotions, connecting you with your energetic heart zone and releasing stress. With practice, you can learn to do it routinely in about a minute. You can apply the three easy steps, Heart Focus, Heart Breathing and Heart Feeling, first thing in the morning; during school or at work; in the middle of a difficult conversation; when you feel overloaded or pressed for time; or any time you simply want to get in sync. Athletes use Quick Coherence whenever they need to boost their energy levels, coordination, reaction times and speed while engaged in sports. Military, police and firefighters use Quick Coherence to maintain alertness and the ability to think quickly on their feet, especially in extreme situations. You can use it to help you improve your test-taking and scores, get along better with others and relax and calm down when you are feeling anxious or stressed. The Quick Coherence Technique for Ages 12‑18. Interesting in learning more? Check out their Facebook pages (HeartMath My Kids! and Institute of HeartMath) as well as their official Twitter (@InstHeartMath). Edtech company eInstruction has launched the 2010 Interactive Classroom Makeover Contest, where you could win up to $75,000 worth of resources for your students. Winners will be chosen in three categories: grades K-5, 6-8, and 9-12. Entries will be accepted until November 3, 2010. Sounds like a good class project even if you don't end up winning! 52 Teachers, 52 Lessons: Let's Complete This Project! What is the most important advice you can give to other teachers? Entries came in from everywhere, but unfortunately, the project stalled after 39 weeks of great ideas. I shelved it indefinitely, but I knew that one day I would finish what I had started. Email me (teachforever AT gmail DOT com) a short, 100-300 word submission along with your name, where & what you teach, and your blog or website (not required). I will omit any information you don't want published--you can be anonymous if you'd like (but please email all the information anyway, as it is interesting to me). There are no qualifications to write besides being a current (or retired!) teacher; you can submit no matter your subject, grade level, school type, or country. Just try to write with the largest number of teachers in mind (all of them if possible). I do reserve the right to choose what will or won't be published (just like the Carnival of Education) and will likely post things in the order they were submitted (although I am flexible). One last thing: I'm happy to give each participant a digital copy of either one of my books, Ten Cheap Lessons or Teaching is Not a Four Letter Word, your choice. I'm looking forward to your new ideas! Addressing Comprehension Errors [Creating Lifelong Learners] - Things to think about when creating assessments, preparing students to take them, and how to reteach. Teaching and boxing [Lance Bledsoe] - What new teachers can learn from the sweet science. Effectively Managing Your CYA (Cover Your A**) Folder [Math Tales from the Spring] - How to make sure you're ready for unexpected absences you'll take at some point. Fidgeting and Doodling Could Be Unconscious Focus Tools [Lifehacker] - Keep this in mind before you jump down any kid's throat. 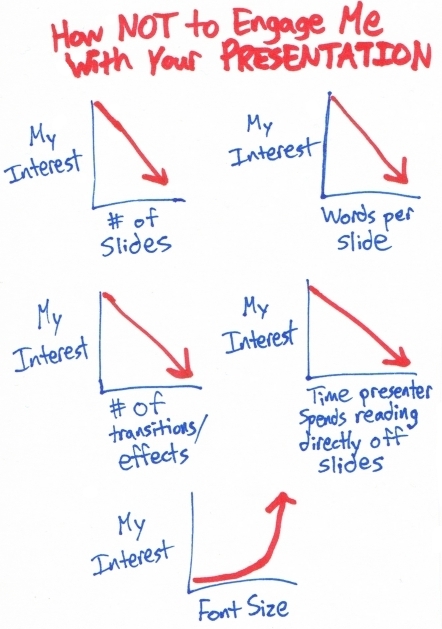 How Steve Jobs beats presentation panic [Macworld via Lifehacker] - If you're doing a lesson using a LCD projector, a computer, the Internet, and/or any technology, occasionally you're going to run into problems. In this article, we learn how Apple's CEO keeps a presentation going smoothly even when things don't work as planned. So don’t you ever for a second ever forget, domain and range! Cause the truth of the matter is… domain and range are so is easy! Read about how I originally used this in class in Teaching Domain and Range (with a little help from Beyonce), and then read even more about it from my 2008 book, Ten Cheap Lessons: Easy, Engaging Ideas for Every Secondary Classroom. Mr. D TV is my weekly teacher advice video series. 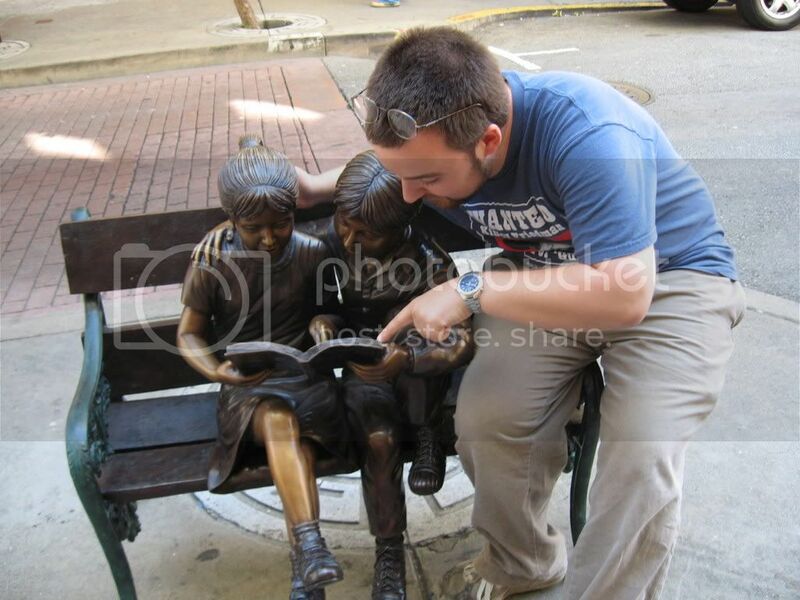 I cover just about any topic related to education and teaching. If you have a question you'd like me to answer, email me (teachforever@gmail.com). If you like the video, check out last season's finale and my YouTube channel for more. Kindergarten teacher extraordinaire Mr. Halpern, who blogs at Look at my happy rainbow!, just wrote a great post about why he loves his job. This is a time of year to make sure you have an answer to that question, because it's going to frame your entire year. It's not just a question for teachers, either; it's for school leaders, district administrators, and everyone else within the ed sphere. If you're having trouble thinking of anything, you really need to reevaluate why you're working in education in the first place. You don't have to love everything about it--very few do--but there should be something that you absolutely adore. So what do you love about your job in education? Share your answers in the comments, Facebook and Twitter. A new board game called Wild Ride to the Heart is a fun, engaging way to teach young children how to deal with often difficult emotions. This would be a great resources for parents, teachers, counselors, after school programs, social workers, and anyone else who works with kids. Players move around the board towards the heart, thinking and talking about different emotions along the way. Generally speaking, dealing with emotions positively moves you forward while losing control sends you backwards. That message is important for young children by itself, and it's fundamental to winning the game. Before and during the game, players are encouraged to talk about emotions with their own stories and experiences. This ensures that you're reinforcing the lessons and offering plenty of opportunities for teachers and parents to dive deeper into often difficult emotions that will undoubtedly surface. What makes the game most valuable for parents and teachers are the Tools of the Game, a procedure that kids follow when they land on one of the faces on the board. They can either show a matching face, tell a story about a time they experience that emotion, or "Go to the Heart". That last one means they perform a sort of calming exercise while focusing on their heart. It's very simple and I think would be very fun for young children up to 3rd grade. I think some people might assume that you would only play this with children who were having a lot of trouble controlling their emotions. The game clearly provides a safe environment for kids to talk about emotions, and should be very helpful with kids already having problems. Yet I would urge parents and teachers to play this will all students, even those who appear emotionally healthy, as serious emotional issues can show up or develop later. By giving kids a good foundation, you're setting them on a path to deal with whatever comes their way. GIVEAWAY ALERT! I'm giving away the copy of the game I received from the Institute of HeartMath, which includes the complete game as well as background information on the Institute. For a chance to win, contact me via Twitter or Facebook only and tell me who you would play this game with and why before Friday 8/27. I'll pick one winner randomly. The game is actually very inexpensive ($14.95 before shipping) and worth your money. Order it direct from the Institute here. Classroom Management for the Secondary Math Classroom [Math Tales From the Spring] - Pretty much of all of Mrs. H's advice applies to any and all secondary classrooms (except for the rules about calculators). Top 20 Websites No Teacher Should Start The Year Without [Making Teachers Nerdy via Shelly Terrell] - Don't worry, it's not a list of education/teacher blogs, but more a collection of practical resources. 1 glass paperweight hand-crafted at the Glasshouse (it says "Discover Jamestown" around the edge, surrounding an image of the iconic ships that brought settlers there. What crop did the Jamestown settlers begin to grow that saved the colony and soon became the most important crop for the economy of the southern colonies? Send your response to teachforever@gmail.com. Good luck! UPDATE 8/13: We have a winner! Thank you to everyone who wrote in--everyone who did knew the correct answer: tobacco. Remember, I'm doing giveaways like this every week in August, so keep checking back to see what you can win! If you haven’t seen Inception, I won’t spoil it for you, but it revolves around a simple question: Is it possible to place an idea in someone’s head, so that they believe they came up with it themselves? This process is called inception. In the film’s opening moments, Leonardo DiCaprio’s character explains that an idea is more powerful and virulent than the nastiest virus—once it’s in your head, it’s almost impossible to get out. True enough. Yet all the characters also work off the premise that inception is difficult, if not impossible, to accomplish. I disagree: great teachers master this skill and use it from the first day of school. It's no secret that good teachers work to make the transition from providing information to providing the opportunity for students to learn on their own. When teachers become facilitators, that's when students start learning amazing things. That's inception. Inception also happens when teachers set out clear expectations on the first day of school and model them consistently throughout the year. Now you might say, "but that's not the same thing. You're planting the idea and eventually they just following along." With certain things, you're right. If you tell them they should do something because you as the teacher think it's important, some students will follow suit. But make no mistake: no student will ever buy in completely if you straight up tell them something. At the risk of sounding too existential, a lot of it is just about being there. I'm a believer that who you are as a person can make all the difference in what will happen in your classroom in a given year. Students observe you and other and ultimately make their own decision. If you lead them down a path to success without really trying, just by being there, that's also inception. So teachers, I challenge you: can you get deep enough inside your students' minds to plant a good idea? I think you can. As technology continues to evolve and encroach upon every facet of our daily lives, the line between public and private spheres turns more and more gray. And with new social networks popping up every day, it seems almost impossible to keep your private life truly private anymore. As a teacher, and a normal human being, where does the classroom end and your real life begin? Can you truly keep your personal life separate from the professional atmosphere of your school life? Are you always a teacher, and never a person? Or are you able to distinguish and keep isolated your two different social worlds? Are you able to trudge the fine line separating what you deem private and what you deem public? Making sure you adhere to a few simple guidelines regarding online interactions can keep you and your personal life safe from prying eyes. Consider the following three suggestions for protecting yourself in the world of social media, and you'll keep the line between your public and private lives distinct. Double check your privacy settings. Within most social networks on the internet – Facebook, MySpace, Twitter – you control the privacy settings of your personal account. This function allows you to choose who you want and who you don't want to view your personal profile. Take extra care when reading through these options and be sure to choose one that allows you to maintain your freedom within the confines of your personal account without having to make certain compromises for certain audiences. You can even choose to only allow those you're friends with to see your profile, insuring that students, parents, and administrators don't have access to your personal account and information. Be careful who you add. Friend requesting is the easiest thing to do on most of these social networks. Anyone – from friends and family to students and coworkers – can locate you and request to be your friend by simply typing in your name. Don't add anyone who you don't want seeing your personal account. If you've already adjusted your privacy settings, then those who aren't your friends won't be able to access your profile. This is probably the most integral part of maintaining that line between personal and professional. After making sure to mark your profile private, only allow your closest friends and family to have access to view your account. This is the true purpose of the social media, anyway, functioning as a convenient way to communicate with those you ordinarily wouldn't be able to. Don't go phishing. Identity theft and scams are one of the biggest issues surrounding these social networks. It's all too easy for random strangers to collect your personal information by tricking you into giving away personal information – usernames, passwords, credit card numbers – by dragging you to outside websites and promising you Ipods if you finish thirty surveys. These phishing scammers can easily collect all your private information and create profiles and accounts using your own identity, impersonating you for all the world to see and leaving your reputation and integrity vulnerable to scrutiny and defamation. Carol Montrose is a writer for Online MBA Rankings where you can browse the top online MBA programs. Mind the Gap: Taking Attendance [GOOD] - A teacher offers ideas and solutions for a class with poor attendance. Recipe for Success [Math Tales from the Spring] - A simple takeaway from this post: if you focus too much on the negative, you'll forget there's so many positives! Talking Out Loud Improves Memory Retention [Lifehacker] - This is why successful teachers always have kids repeat back instructions, ideas and ask whole group questions instead of just telling their students everything. They also tend to let students talk out problems and work collaboratively instead of having them sit silently and work independently at all times. The problems with Lemov's Teach Like a Champion [The Number Warrior] - A companion piece to a book that a lot of teachers will be referencing as they get ready to go back to school this year. As promised, it's time for the first weekly giveaway of Back to School Month 2010. This giveaway is a chance to get the digital version of my new book, Teaching is Not a Four Letter Word: How to Stop Worrying and Love the Job. All you have to do is tell me who you're going to give it to when you're done reading it, and why. The most compelling explanation of who you'll share it with and why will win. It's important to me that my work gets in the hands of people who need it, even if that means giving it away. So I'll be picking one winner daily, starting today and ending next Wednesday 8/11. Leave a message on our Facebook page with the same tag. Post your who and why in the comments section of this post. Please include the tag! Enter as many times as you like between now and Wednesday, 8/11. I'll be contacting winners for their email address each day, so make sure you're check the page where you entered every day this week! Winners will be announced daily in the comments, on Twitter and Facebook. No entries will be accepted via email--you know where to go! **I added the option of leaving a comment since Twitter and Facebook are often blocked at schools, and I certainly don't want to keep educators from entering. Good luck! "I am here to help you learn. I care about your success. I will do what it takes to help you succeed. These goals carry importance for you far outside my classroom." Let's say one goal is for students to be able to know how to solve problems on their own, something this teacher and I had discussed. Solving challenging problems is not a course-specfic skill by any means, so you can tell your students that the skills you learn in math class are going to help them in every class they take. You should also connect this kind of skill to being prepared for college, and for being an independent adult in the real world. The message, as I said before, will be clear: This is going to help you for the rest of your life. Of course, just conveying these messages on the first day of school will not be enough to fully invest any given student. You have to revisit your goals throughout the year. It will frame your design of a Do Now that accesses prior knowledge; it will be something you clearly state when kids get that “what is the point of this” look during a lesson. You'll design lessons and projects with these goals either implied or in plain sight. There's also a reason why your goals should be not just about scores but skills: your multifaceted goals will allow you to tailor your message to particular students. The kid who has never passed a state test will like the idea that you will get them to pass and won't give up on them. The kid who's already decided they're going to college will be excited by the idea that you're teaching them real skills they need, not just teaching them a test they're already going to pass. And a whole lot of kids will buy in to the idea that you really care about them. Good luck and keep planning--it will pay off over the long term!